Have you ever thought what it would be like to travel the world and see it all from behind the wheel of an RV? It can be done, and done in style. In February 2012, I had the pleasure of being introduced to The Cooking Ladies, Phyllis Hinz and Lamont Mackay, while in Las Vegas, at an International Food, Wine and Travel Writers conference. I was there as a speaker and my presentation was on the subject of independent publishing, and was pleasantly surprised to meet two well-established authors, The Cooking Ladies. They are a dynamic writing and photography duo, who share an appreciation for culture and cuisine, and they do it all from their RV. They have co-authored nine cookbooks and travelogues. They are freelance writers, food and travel bloggers, in addition to being traditionally published authors. From Canada to the US, they uncover what the world of food and travel has to offer, from behind the wheel of their motorhome. Before they decided to hit the road full-time, they spent 20 years in the restaurant business, as restaurant owners and caterers. With their successful food service experience, they consult for eating establishments, from diners to upscale resorts. Their professionalism and high energy make them popular event speakers, food judges, and guests on radio and television. It is clear they love exactly who they are, what they are doing, and where they are going, “Our lives are pretty exciting, always changing. We have the luxury to do what we do because we can. This would be hard to replace.” No hobbies required, they are living their dream. 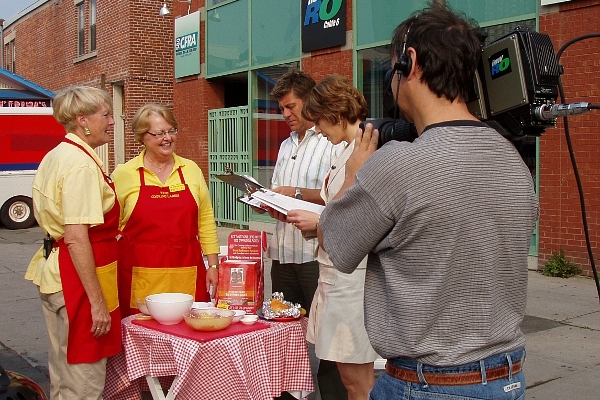 To learn more about The Cooking Ladies, Phyllis Hinz and Lamont Mackay, go to www.thecookingladies.com.